Can give a traditional look to a quilt by stitching a pattern in the center of each quilt block. A separate pattern stiched on the outside border of a quilt like a frame. Can give a traditional look to a quilt by using a square or diamond shape that fills the entire quilt. Consists of a ¼” stitching inside or outside a patch or appliqué piece. One pattern stitched over the entire quilt. Consists of several ¼” stitching following the inside or outside a patch or appliqué piece to fill an area. Looks like puzzle pieces. It can be used to flatten or fill an area using small or large stippling pattern. Stitching is done in seam line between patches. 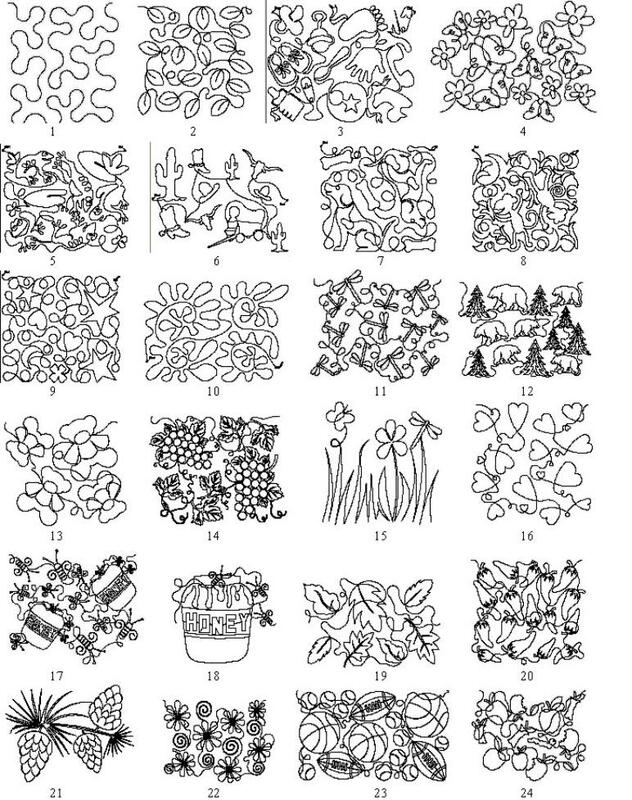 Below is a very small sample of patterns to choose from. Please let me know what you’re looking for so I can locate a pattern especially for you.